It's easy to imagine the Sahara as a lifeless and timeless place, where the relentless forces of nature rule supreme over any sense of human history. However, that’s far from the truth. 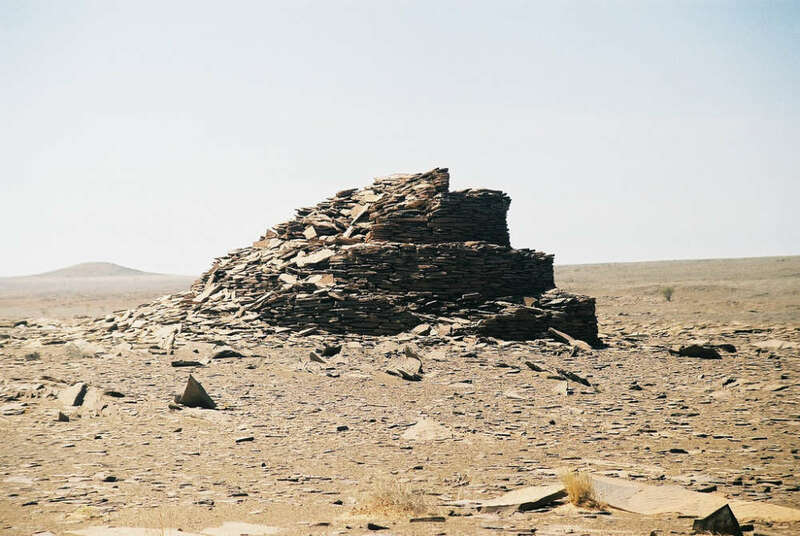 Odd corners of the Western Sahara, found along the northwestern coast of Africa, are littered with hundreds of ancient stone monuments from centuries worth of human culture, some of which date back to over 10,000 years ago. 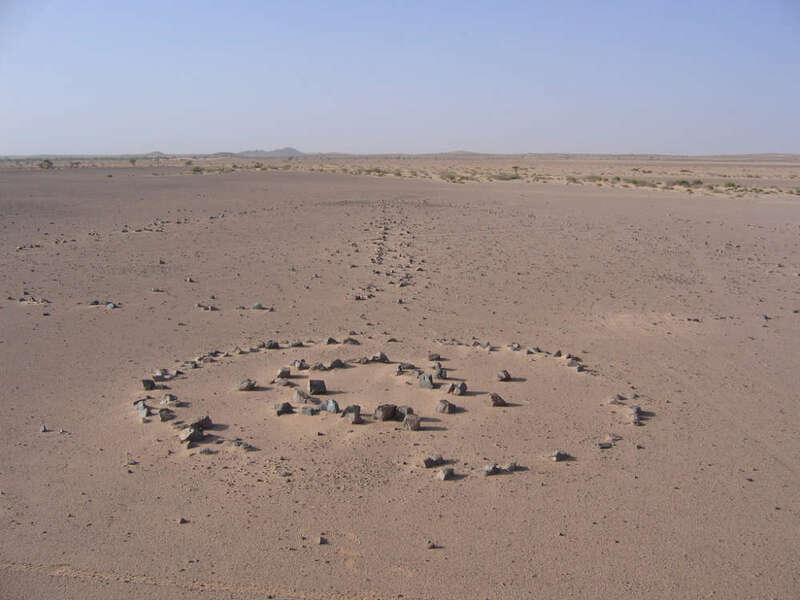 Between 2002 and 2009, the Western Sahara Project, led by the University of East Anglia in the UK, documented the archaeology and environment of northwestern Sahara around the oasis town of Tifariti. As first reported by Live Science, their findings were published in the book The Archaeology of Western Sahara: A Synthesis of Fieldwork, 2002 to 2009. The monuments come in a variety of forms and were constructed by a number of different cultures across the centuries. Many appear to be little more than long rows of heaped rocks, while others are purposefully placed large stones standing proudly in a circular pattern. Others, like the "bazina," are imposing 5-meter-high (16 feet) dry stone wall constructions (pictured below) that could have only been built by human hands. It’s unclear what most of the monuments are meant to signify, although most are assumed to be burial mounds, used as part of a funerary ritual, or hint at the presence of a grave. This desire to construct burial mounds is something that can be found in countless cultures across the planet, from the Scythians of ancient Siberia to the sea-faring Vikings of northern Europe, and it looks like the ancient people of Western Sahara were not different. The Erqueyez Archaeological Park in Western Sahara is home to hundreds of caves scrawled with rock paintings, documenting animal species, such as gazelles and antelopes, and even species that are no longer found in the area, such as giraffes, elephants, and rhinos. For one reason or another, this natural basin area managed to remain a hive of human activity over the millennia, especially when times became tough in the surrounding areas. “One of our theories is that as the Sahara dried in the mid-Holocene—between five and six thousand years ago—this is one of the refugia, an area where water remained,” research Joanne Clarke, prehistoric archaeologist at the University of East Anglia, told Atlas Obscura. Part of the reason this neck of the woods has remained relatively unexplored by archaeologists is due to ongoing armed conflict between Morocco and the Sahrawi Arab Democratic Republic, both of whom lay claim to the region. However, as these inticing monuments clearly show, there is much to learn about this land and its numerous run-ins with humans.